Revision3 was faced with a dilemma: Its Flash player was getting a bit long in the tooth, but Flash isn’t supported by a growing number of devices that its viewers are using to watch its videos on. The company had already built an HTML5 player to be used by viewers with iPads (s AAPL) and other HTML5-compatible devices, but it wasn’t as advanced as what the startup had built into Flash. As a company with limited resources, updating both players wasn’t really an option, so it had to choose between updating its Flash player, or placing more emphasis on HTML5. That doesn’t mean Revision3 is dropping Flash altogether: It’s keeping the old player around for those whose browsers don’t support the HTML5 player or H.264 video codec. When a viewer tries to access a video, Rev3 will automatically detect the browser and device a user is using and determine if it supports the player. If the browser isn’t HTML5-compatible, Revision3 will serve up its legacy Flash Player instead. While Revision3 sees HTML5 as the future of video, DeMillo noted that the new player isn’t fully at parity with features that were available in Flash. In particular, there are things like theater mode — where the player dims out the rest of the page while a video plays — that don’t quite work yet. DeMillo said that HTML5 isn’t exactly the panacea that it’s made out to be. Development meant tweaking the player to make sure it worked across different browsers and even across different versions of the same browser. “It felt very much like 1995,” DeMillo told us. That said, the folks at Revision3 expect more video publishers — especially smaller independents with limited resources — to follow its lead over the coming years. Rev3 CEO Jim Louderback said he thinks others in the industry will be faced with the same decisions soon, and will likely choose to move to HTML5 more exclusively going forward. 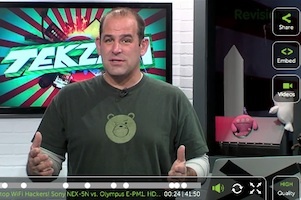 RT @gigaom: Revision3 bets on HTML5, drops Flash player development http://t.co/vWx061Gk. Another one bites the dust!